“There are only two options regarding commitment. You are either in or out. There is no such thing as life in-between.” This quote by Pat Riley, an American professional basketball player is so relevant when it comes to our goals. The key is to get into a routine, so that it does not fizzle out over time. This process of commitment is a continuous process. It is a journey. It is about pulling yourself together when you start feeling that everything in this world is against you. To get into a self-sustaining mode to achieve your goals, you need to master the skill of focus, Like any other skill, the key to mastering your focus is to be able to sustain it. In order to get there, it is critical to develop what I refer to as a “life code.” A life code can be easily understood through the metaphor of a wheel. A wheel has a hub, which is the central part of the wheel and a series of spokes. These spokes support and strengthen the center, and the overall wheel. They help transmit the torque from the hub out to the wheel. Without the hub and the spokes, the wheel cannot function. The wheel is your life, and the hub is your life code. 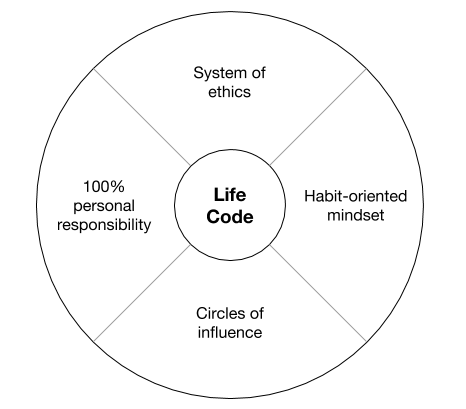 This life code has 4 spokes or elements around which we define our code. These 4 elements reinforce our life code. Do you have a charter of right or wrong? What is your personal value philosophy? Having a system of values and ethics directly translates into your daily actions. It helps you quickly solve problems that fall in gray areas. They act as a set of guidelines that help you make fair decisions. When you don’t have a clear system of ethics or a have one that is based on convenience then it’s all up for grabs. It becomes easy to give-in to your comfort zone. For some people, a system of ethics may be derived from their religion, for others, it could be from their education system. For someone, it could be purely experiential. Whatever your source is, it is time to develop your personal system of ethics, if you don’t have one already. Whenever we begin to chase an elusive or a vague thought or idea, we start creating goals. Many of us go even a step forward and create yearly, monthly, weekly and daily goals. When you set goals, you immediately start to focus on the outcome. I want to get to 165 lb, for example. The outcome (165 lb) suddenly becomes important and if you don’t reach that outcome or you deviate even for one day you term it as a failure. A lot of times, it’s our willpower that sets us into the initial action. And, we feel motivated for a while. But, what happens after a while? Things start to fizzle out because willpower is momentary. When you are thinking goals, start developing a habit-oriented mindset. Without habits, our goals are easy to miss. By creating a good and well-crafted set of habits, we can ensure that we not only reach our goals, but even sometimes overshoot them. Let’s take an example of writing a book. The goal is to write a book in 6 months – a 35,000 word book in 6 months! When you look at this simply as a goal, it may look daunting and could easily put you into a nervous inaction mode. Rather, if you focus on creating a daily habit of writing 200 words, it suddenly seems attainable. With this daily habit, you could easily be on track of completing your book within 6 months. And, on some days, when your creative juices are flowing, you could even write 600 words or more. Cultivating positive habits has been the key to many successful people. Be it Warren Buffett with his ardent reading, or Oprah Winfrey with her practice of stillness and meditation. We are creatures of reciprocity. It is in our nature to be socially obliging. How we associate ourselves with people determines how they influence our lives. If you are surrounded by negative people, you tend to play victim too. If you spend time with average people, you become an average person too. An important aspect of developing your life code is to develop clear and concentric circles of relationships that help you in the long run. These relationships are the very people you need (vs the people you currently choose to be with). It’s about having them around to support and empower you as you accomplish your goals and move to your glory. There are 3 concentric circles of influence that you need to create and nurture. The first one is your relationship with yourself. You are your biggest influencer. You have all that it takes inside of you. Developing a strong relationship with yourself makes you internally-driven and accept where you are at life. The next circle is your family circle – your spouse, your kids, your siblings and your parents. They have a strong influencing power on you and you need to acknowledge that. Your family is your most influential supporter after yourself. The third and the last concentric circle is your relationship with your network, your mentors and your coaches. Real friends and mentors are never apart, and you need them to keep you growing. When you create and nurture these circles of influence, you start to get a completely different perspective on your life and your goals. Your life takes a dramatic u-turn and you suddenly start to experience life by design and not by default. Imagine you start taking actions towards your goals and everything is smooth sailing. But, suddenly, something goes wrong. Do you immediately start blaming and complaining about just about everything? Do you externalize the blame? We are all conditioned to point outwards. It’s easy to blame everything external to us for the situations we are in. Developing a life code takes more than just taking action. It’s about personal responsibility. It’s about taking ownership for all those actions (and inactions too!) and accepting all the decisions taken that led to the situation. It’s not about giving excuses or blaming others for the situations created in your life. When you start taking 100% responsibility, you start looking inward. And, that’s where most of your answers lie. Developing a life code that is based on having a system of ethics, a habit-oriented mindset, clear circles of influence and 100% personal responsibility gives you the power of sustenance. It is the formidable force that helps you take action in the right direction each time. Stay with your code!